Daniel Ballinger's FishOfPrey.com: TF20017: The area or iteration provided for field 'Iteration Path' could not be found. TF20017: The area or iteration provided for field 'Iteration Path' could not be found. Then jump to the Iteration tab and use the "Add a child node" button. 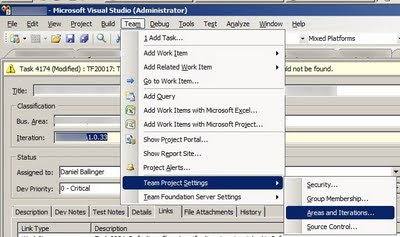 Close Visual Studio to release any file locks in the cache. cool. that fixed it for me. I wonder when it will be fixed without doing this work around!